Most painting jobs are completed without any problems but occasionally things go wrong, generally because of circumstances beyond the control of the painter or the paint manufacturer. Here are some of the defects that may occur, their causes and how to remedy them. A defect in which the appearance of a paint finish is marred by small particles of extraneous material, typically dust, grit, broken paint skin and fragments of bristle from brushes. It is usually due to lack of care and attention to cleanliness in preparing surfaces, materials and equipment, although very occasionally the paint itself may be at fault. To reinstate a bitty surface, allow the coating to harden and then rub it down carefully with fine waterproof abrasive paper, preferably used wet and recoat with fresh material using clean equipment. Remove skin and strain paint into a clean kettle. Remove all dust and dirt before painting and clean all brushes/rollers. If the paint it severely contaminated, discard the paint. Staining or discoloration of the applied paint by the previous coating. A soluble matter leeching out from a substrate of previous coating causing discolouration of fresh paint. Amongst substances likely to cause bleeding are bituminous coatings and residues, some dyestuff and lake pigments, metallic inks used on wallcoverings, tobacco tar deposits and resinous materials in timber. Stained areas resulting from burst pipes or overflows may also ‘bleed’. Is within the surface to be painted, e.g. on creosoted or resinous timber, and the usual approach in these instances is to apply an Aluminium Sealer. However no attempt should be made to seal bituminous materials, including creosote, until they have aged for at least a year. It may never be possible to overpaint thick, soft bituminous coatings satisfactorily. Bleeding from metallic inks in wallcoverings can usually be prevented by applying an Alkali Resisting Primer as a sealer, although it is usually better to remove the wallcovering altogether. Alkali Resisting Primer is also effective in preventing bleeding from residues of tobacco tar, (nicotine staining), which may remain after the surface has been washed thoroughly with detergent solution in the absence of a more specialist primer. Bleeding may not become evident until some time after painting has been completed and it may not then be practicable to remove the whole coating and deal with the problem at its source. In this case, application of the appropriate sealer followed by further coats of finish may provide a remedy. Essentially, blistering is a form of localised loss of adhesion of a flexible paint film. As the film becomes more rigid, e.g. with age, adhesion failure is more likely to take the form of flaking. completing painting. 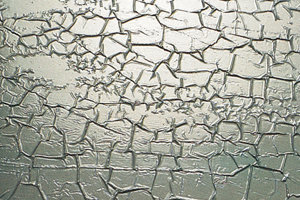 In service, moisture may gain entry through open joints and defective glazing putties or as a result of defects in design. 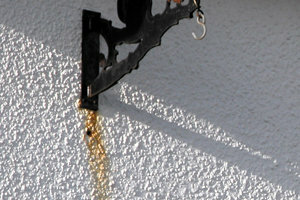 Blistering of paint on apparently dry external woodwork, especially on south-facing elevations, may be caused by a combination of resin in the wood and the sun’s heat. In such circumstances it is better to use light-coloured paints which reflect heat rather than dark colours which absorb it. Badly blistered paint must be stripped and, if moisture is the cause, time allowed for the substrate to dry out. Isolated blisters can usually be removed and the resulting depression filled and brought forward before recoating overall. This appears as a whitish appearance particularly visible on deeper colours of gloss paints, accompanied by the loss of gloss. While it may be difficult to nominate the exact cause of blooming, atmospheric changes during a critical stage of the drying may be a factor. Blooming may appear later in the life of the paint and be due to atmospheric pollution. In all cases it is worth an attempt to remove by washing with a detergent solution and then leathering off dry. Blue stain is a fungus which results from moisture penetrating at the joints of woodwork. Once staining has gained a hold it is not possible to eradicate the colour stain. 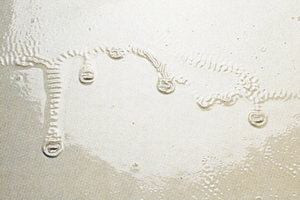 These are powdery residues formed on a paint finish when the surface begins to erode from exposure to the weather. Chalking is not usually considered a defect unless it occurs prematurely. A good gloss paint may soon begin to chalk if used over a porous surface, which has been insufficiently sealed. 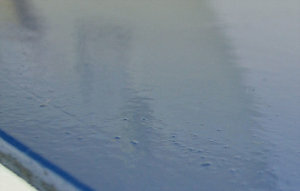 In these cases the finishing gloss loses some of its medium by sinkage into the previous coats, leaving it liable to more rapid erosion on weathering. Fine residues of chalking can usually be removed with damp cloths, revealing a sound paint surface of good appearance. 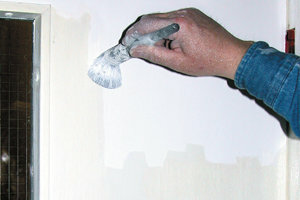 Heavy residues of chalking due to ineffective priming or omitted coats of paint, are likely to cause problems when repainted unless all the paint is removed. 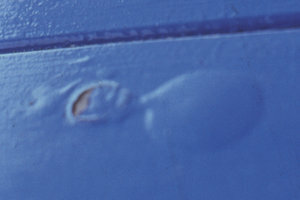 This describes a defect in which freshly applied paint recedes from the surface leaving small craters or bare areas. The usual cause is contamination of the surface, e.g. by grease, oil, wax polish or silicones. All forms of the defect are indicative of stresses within the coating system which it is not sufficiently flexible to withstand. This may be the result of ageing and consequent embrittlement of the system; of movement, (e.g. expansion or contraction), in the substrate or of the application of hard-drying coatings over softer ones. A typical example of the latter occurs when soft bituminous coatings are overcoated with conventional paints. Slight surface cracking, checking or crazing can sometimes be remedied by rubbing down, filling if necessary and recoating. In severe cases and especially if the cracks extend through the whole thickness of the film, the surface must be stripped. The usual causes are uneven application to broad, flat surfaces or over-application to mouldings and to rough or contoured surfaces. Failure to join up ‘wet edges’ before they have set may result in excessive film thickness and curtaining or sagging. To remedy the defect, the coating must be allowed to harden thoroughly before flatting down and recoating. Prevent curtaining by applying the coating evenly and avoid heavy coats. Plan the work accordingly so that the wet edge is kept open. There are many possible causes of the discoloration of paint films. It is often the effect of atmospheric pollutants on ingredients in the paint. Exclusion from natural daylight may cause yellowing, of paints containing drying oils whilst exposure to bright sunlight may result in fading of some pigments. Some types of moulds or fungi can also cause discoloration of paints. When discoloration has occurred, there is usually no alternative to repainting, but if a recurrence of the defect is to be avoided, it is necessary to establish its cause and, if possible, to use materials resistant to the conditions. If paint remains soft, tacky or even wet for a long time, possible causes are application in unsuitable conditions, e.g. poor ventilation, low temperature, excessive humidity, chemical pollution or application to surfaces on which there is grease, oil, wax polish or similar contaminant. Drying may also be retarded if a preceding coat has not been allowed to harden sufficiently. The use of unsuitable thinners may also retard drying. 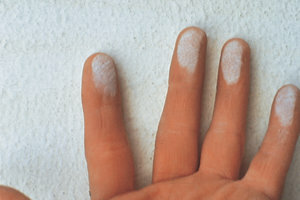 An improvement in atmospheric conditions, when these are the cause of slow drying, may allow the coating to dry eventually although it is likely that its appearance may be impaired and a further coat may be required. When surface contamination is responsible, it will usually be necessary to remove the affected material, clean the surface thoroughly and repaint. New plaster, rendering, brickwork and similar materials may contain soluble salts which, as the substrate dries out, are brought to the surface where they crystallise as a thin, hard film or a profuse, fluffy growth. Efflorescence may also occur on aged surfaces if they again become wet, e.g. as a result of leaks or overflows. The fluffy type of efflorescence may disrupt paint coatings, particularly the relatively impermeable oil based types, if they are applied before the substrate has dried out and the growth has ceased. Emulsion paints may permit the salts to pass through the film with relatively little physical damage but they may affect its colour or appearance. Efflorescence should be removed with a dry, coarse cloth at intervals of 7 - 14 days and painting should be deferred until the growth ceases. When efflorescence has disrupted a paint film the affected area should be stripped and repainting delayed until it is clear and the efflorescence has stopped. As with blistering, moisture beneath the paint or varnish film is a frequent cause of flaking as is the application of paint to powdery or friable surfaces and previous coatings. Dirt, oil, grease and polish residues on the surface impair adhesion and may result in flaking. Excessive movement of the substrate, e.g. at joints in woodwork, may impose stresses on the paint film causing cracking, and ultimately flaking. Small areas of flaking paint can often be dealt with by removing the loose material back to a firm edge, touching-in and bringing forward as necessary, then recoating. If the flaking is extensive or the overall adhesion of the system is doubtful, the surface should be stripped completely before repainting. The presence of glossy patches on a painted surface is known as flashing. Flashing can be caused by applying paint over an unprepared surface which can can cause uneven sinkage due to different absorption rates, the edges setting before the joins are overlapped mainly occurring on ceiling and walls or the use of cheap paint. Remember that preparation is key! Apply paint over a well sealed and undercoated surface, increase the time of application, use better quality products and reduce the room temperature. A gradual loss of gloss is to be expected as a finish ages. Early loss of gloss may be caused by applying paint or varnish in unsuitable conditions, e.g. low temperature or high humidity, or to surfaces on which there is grease, oil, wax polish or other contaminant. Failure to satisfy the porosity of the surface or the use of poor quality undercoats may result in sinkage of the finish and loss of gloss. Over thinning and the use of unsuitable thinners are other causes. Some of the causes of loss of gloss may also cause slow drying. If the coating dries satisfactorily and is not otherwise affected, application of a further coat will usually restore the gloss. A softening or disturbance of a coating when another coat is applied, especially by brush. With conventional decorative paints, lifting is usually due to application before the previous coat is thoroughly dry. Solution-type coatings, such as those based on chlorinated rubber or nitrocellulose, tend to soften when recoated with similar materials and for this reason are best applied by spray to large areas. Coatings of this type may also soften oil based paints, even when these are thoroughly aged and a small scale test to check the resistance of the existing coating is advisable. These are unsightly and may be destructive of paint coatings. Moisture is an essential requirement for the development and growth of moulds and they are especially likely to occur in conditions of high humidity or on surfaces with a high moisture content. Remedial treatment should include reduction in humidity and moisture content if possible, and the application of fungicidal washes to kill the growth. Read how to Combat Mould here. The failure of a paint system to hide or obliterate the colour of the original surface or the previous paint. It may be caused by applying too few coats, using an undercoat of unsuitable colour, excessive spreading or uneven application of the paint. Over thinning of the paint and failure to incorporate settled pigment by thorough stirring are other causes. To remedy the defect, it is necessary to apply further coats, avoiding any earlier faults in thinning, stirring or application. Describes the appearance of coarse or heavy brushmarks in a paint finish. Although mainly visible in high gloss finishes, brushmarks are usually in the undercoat or primer and may not be seen until the gloss finish is applied when it is too late for an easy remedy. Ropiness may be caused by using paint which is excessively thick as a result of age or evaporation of solvent; by unskilled or careless application, (especially of the undercoats), or the use of brushes of unsuitable size or poor quality. To reinstate a ‘ropy’ surface the paint must be allowed to harden thoroughly before rubbing down, preferably with a waterproof abrasive paper and water, and recoating. With water thinned paints, brushmarking can be caused by overbrushing or inadequate thinning, particularly on very absorbent surfaces. 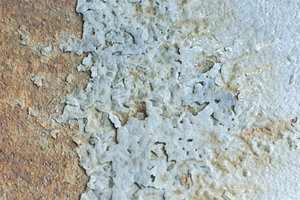 The defects in a paint film which can be traced to rust forming under the paint are due mainly to insufficient preparation of the metal, including incomplete removal of millscale. Breakdowns are usually first of all seen as blistering or cratering and followed by the complete breakdown, as wholesale lifting and flaking. Complete removal of the paint corrosion and millscale is essential before repainting. The surface must also be dry. The priming paint should be applied immediately after preparation, ensuring that a suitable primer and adequate paint systems are used. The effect of alkali on oil based paints in the presence of moisture. Mild attack causes the paint to soften and probably discolour; in severe cases the paint may be completely destroyed. Alkali in damp cement, concrete, lime plaster, asbestos or similar materials and contact with alkaline solutions will cause saponification of oil based paints. When saponification has occurred, the surface must be stripped, washed and allowed to dry out completely before repainting. If the paint is likely to be in contact with alkaline solutions, as in some industrial environments, non-saponifiable specialist coatings may be required. On long storage, the solid constituents of paints, notably the pigment, tend to settle out. Unless the settled material is properly reincorporated, the opacity and other properties of the paint may be impaired. Thorough stirring with a broad-bladed stirrer, using a lifting and beating action, is effective for small quantities of paint. For large quantities, a mechanical agitator is useful. When paints known to be prone to settlement are stored, inverting the containers at regular intervals, if practicable, is helpful. The occurrence of areas of apparent roughness or uneven sheen in a matt or mid-sheen paint finish, especially when the surface is viewed at a low or glancing angle. When the sheariness is evident, it is often along the ‘laps’ of joins between adjacent sections of the work and a common cause is failure to join up before the ‘wet edge’ has set. Variations in the porosity of the surface may also be responsible for sheariness. Light flatting and a further coat, avoiding the previous fault in application if this is the cause, will usually remedy the defect. On large areas, roller application is often less likely than brushing to result in sheariness. 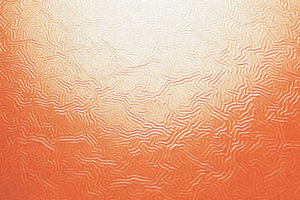 Wrinkling of the outer surface of a paint coating. It occurs most frequently with gloss finishes on exterior work in conditions conducive to the rapid formation of a surface ‘skin’, e.g. in dry, bright, windy weather. Given these conditions, shrivelling is likely to be most severe if the paint has been heavily applied. 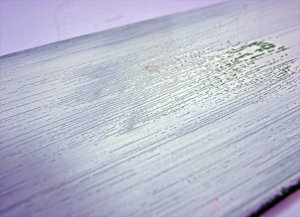 The formation of a surface ‘skin’ reduces the supply of oxygen to the underlying paint; if the coating is excessively thick, it may take several days or even weeks to dry and harden completely. If time can be allowed for the coating to dry and harden, it may be rubbed down, preferably with fine waterproof abrasive paper and water, and recoated. If early reinstatement is necessary, it may be possible to scrape off most of the defective material and remove the residue with a clean cloth and white spirit, leaving the undercoat unaffected. Another coat of finish can then be applied. A problem which arises largely with emulsion paints when applied by roller. It usually occurs when the roller head is too heavily loaded with paint; the roller fails to turn, finding it easier to ‘skid’ across the surface. 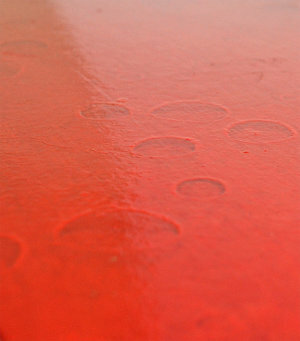 Occurs on freshly painted exterior surfaces when rain hits the surface. Often occurs within an hour of the paint being applied. All oil based paints are prone to yellowing in situations where direct daylight is limited or excluded altogether. Yellowing may also occur in atmospheres containing even small amounts of ammonia or sulphur compounds. Conditions conducive to yellowing may therefore exist in many interior environments, especially in kitchens and adjacent rooms where ammonia and sulphur compounds may be present as combustion products. When yellowing of this type has occurred, repainting is the only method of reinstatement. yellowing of the new paint. As the defect is more obvious with white paint, it may be better to use a pastel colour for repainting. Deposition of tarry matter in tobacco tar, sometimes described as ‘nicotine staining’, may cause apparent yellowing of painted surfaces. The deposit is difficult to remove completely and residues may discolour the new paint, (see Bleeding). To help prevent this, a coat of Alkali Resisting Primer or another specialist primer should be applied after washing the surface with detergent solution.